As far-right protesters prepare to take to the streets of Washington DC for the second Unite the Right rally, one group of LGBT+ activists is fighting back with dancing and rainbow confetti. 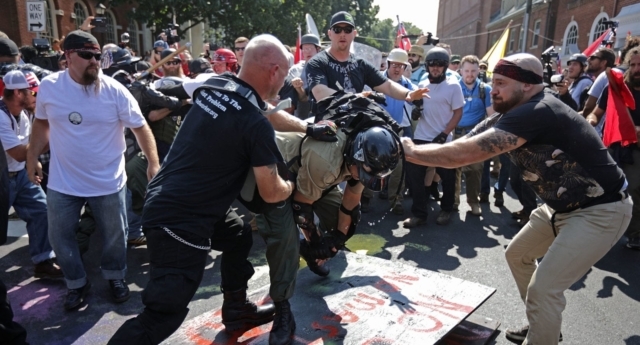 Today’s rally comes exactly a year after the group’s first Unite the Right demonstration, which took place in Charlottesville with devastating consequences. Heather Heyer, a counter-protester at the event, was killed when a far-right rally-goer drove his car into a group of people. Dozens more were injured. Despite the violence that took place in Charlottesville last year, a number of counter-protests to the far-right rally have already been organised, with groups like Black Lives Matter DC preparing to take a stand. The group says it is taking steps to ensure that it is as safe an environment as possible for LGBT+ protesters, however they recognise that they are “dealing with people whose ideology encourages (and necessitates) violence. “We’re trans. We’re queer. We’re fabulous. We’re sick of your Nazi s**t,” they conclude. Donald Trump caused an uproar after the event last year when he seemed to suggest that both sides were responsible for the violence. The Southern Poverty Law Centre said the protest was the “largest hate-gathering of its kind in decades in the United States”.